The characters 100-grains weight, number of seeds per row, grain yield per plot and sugar content were the most important parameters to be considered in parents for effective selection before initiating actual crossing programme, since these attributes exhibited high variability, heritability combined with high genetic advance as per cent of mean. Eight best sweet corn lines with desirable characters were identified and will be utilized in future breeding programmes to develop sweet corn variety and hybrid. Key Words: Genetic advance, genetic variability, sweet corn. Sweet corn differs from dent corn by one recessive gene ‘su’ on 4th chromosome which prevents the conversion of part of sugars in to starch. It has been reported to be a mutant from field corn (Kempton, 1928; Linder storm, 1929; Smith, 1955). 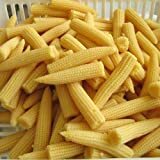 Maduri a sweet corn variety first of its kind in the country was released from Maize Research Station, Amberpet, Hyderabad during 1990. 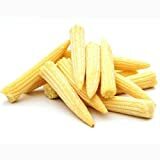 This variety has become popular in Andhra Pradesh and many other northern and southern states of India. It contains about 9% total sugars in dried seed while up to 33% on milky or fresh grain basis. Improvement of sweet corn yields, while retaining quality is one of the major challenges facing the sweet corn breeders (Hunsperger and Davis, 1987).hence, an efforts was made to study the germplasm for different characters and to identify superior sweet corn genotypes that could be further used in future crossing programme to develop high yielding varieties and hybrids. The germplasm used in the present study consisted of 121 sweetcorn inbred lines laid out in simple lattice design with three replications at Agricultural Research Station, Amberpet, and Hyderabad during Kharif 2001. Each genotype was grown in a single row of 5cm length, spaced 75 cm apart with a 20 cm distance between plants within the row. Five competitive plants were selected at random in each entry for recording the observations on plant height (cm), ear height (cm), ear length (cm), ear girth (cm), 100 grain weight (g), number of seed rows per ear and number of seeds per row while data relating to days to 50 per cent silking, days to 50 per cent maturity and grain yield (kg) were recorded on whole plot basis. In every treatment five plants were allowed for selfing by controlled pollination for the purpose of studying the quality characters viz., sugar and protein percentage. The procedure described by Dubios et al., (1956) was followed for estimation of total sugar. Protein per cent in grain was determined by multiplying the total nitrogen content of grain (estimated by Kjeldahls method) with a factor 6.25. The genetic parameters viz., genotypic and phenotypic coefficient of variation (Burton, 1952), heritability in broad sense and gentic advance as per cent of mean (Johnson et al., 1955) were studied for all the characters. The entire success of plant breeding programme in any crop largely depends on the range of variability owing to genetic and non genetic causes, present in that crop (Vavilov, 1951). Hence, the present investigation was conducted to assess the genotypic variability in sweet corn germplasm for 13 characters to identify superior genotypes. Analysis of variance indicated significant difference between the genotypes in respect of all the morphological, quantitative and qualitative parameters (Table-1). The characters viz., grain yield per plot (31.81% and 30.95%), sugar percent(29.74% and 29.30%) 100 grain weight (27.51% and 27.44%) and number of seeds per row (24.73% and 24.50%) were observed to possess high PCV and GCV estimates (Table-2), indicating that, the selection based on these characters would facilitate, easily, the successful isolation of desirable genotypes. Similar findings were earlier reported for these characters in sweet corn by Debnath (1987), Satyanarayana and Sai Kumar (1995 and 1996), Mani and Bisht (1996), Cartea et al., (1996), Hatch kiss et al., (1997) Devadas Ramgopal (1999). Wide difference between PCV and GCV estimates (Table-2) were observed for protein content (1.52) followed by ear girth (1.10), revealing greater role of environment interaction with the genetic factors in the expression of these traits, where as plant height (0.02), ear height (0.03), 100 grain weight(0.07), days to 50 per cent maturity (0.13), days to 50 per cent silking(0.13) and days to 50 per cent tasselling (0.17) exhibited lower difference indicating more influence of genetic factors in determining variability. These observations were also supported by earliler studies of Satyanarayana and Sai Kumar (1995 and 1996) and Devadas Ramgopal(1999). The GCV alone is not sufficient for the determination of amount of heritable variation. Burton (1952) suggested that GCV together with the heritability estimations would give the best picture of the extent of advance to be expected by selection. In the present investigation, high heritability was registered for ear height (99.73%) followed by plant height (99.62%) and 100 grain weight (99.55%) , which is in consonance with the results of Debnath (1987), Satyanarayana and Sai kumar (1996) and Devadas Ramgopal (1999). Low heritability estimates were recorded for protein content (80.01%) and ear girth (84.20%). Devadas Ramgopal (1999) also recorded this type of observations. Grain yield per plot , sugar content, 100 grain weight and number of seeds per row showed high GCV estimates, coupled with high heritability there by pointing to the improvement of these characters through simple per se selection and using them in hybrid breeding programme for development of heterotic hybrids. The heritability estimates indicate only the effectiveness with which selection of genotype can be based on phenotypic performance but fail to indicate the real progress and on the other hand high heritability could be also due to lower influence of environment on genotypes. Therefore, high heritability need not always accomplished by genetic progress. However, high heritability estimates along with high genetic gain render the selection effective (Johnson et al., 1955). In this study the genetic advance as per cent of mean was maximum for grain yield per plot (62.00%), followed by sugar per cent (59.55%), 100 grain weight (56.48%) and number of seeds per row (50.01%) along with high heritability estimates. This situation indicates that the genotypic variance for these characters is probably owing to their high additive gene effects(Johnson et al., 1955). This also confirms the earlier findings of Sing and Sharma (1970). Debnath (1987), Devadas Rangopal (1999). High heritability combined with lowest genetic advance as per cent of mean was noted for days to 50 per cent maturity (8.99%), plant height (13.34%), days to 50 percent silking (15.01%) and days to 50 per cent tasselling (15.32%) revealing little scope for improving these characters through selection and this may be attributed to the non-additive gene effects on these traits(Johnson et al., 1955). Similar types of findings were also reported by Reddy and Agarwal (1992) and Devadas Ramgopal(1999). In brief it can be stated that the traits viz., 100-grain weight, number of seeds per row, grain yield per plot and sugar percent which exhibited high variability, heritability and genetic advance, are the most important characters to be considered for effective selection of parental lines to develop a high yielding sweet corn variety or hybrid. Top eight sweet corn germplasm (viz., NSCC i-4-1-1, NSCC II-2-2-1, TSCC I-1-1-1, ASCC III-8-1-1, NSCC I-3-1-1, ASCC I-7-1-1, ASCC I-1-2-2-1, NSCC IV-II-1-1) (Table-3)with desirable characters were identified in the present study and these lines will be utilized in future breeding progarmmmes to develop high yielding sweet corn variety or hybrid. Burton, G.W.1952. Quantitative inheritance in grasses. Proceedings of Internal. Grassland Cong. 1:227-283. Cartea, M.E., Ra.A. Mahavar., P.Ravilla and A.Ordas. 1996. Indentification of field corn population to improve sweetcorn for Atlantic European conditions. Crop Sci.36: 1506-1512. Debnath, S.C. 1987. Genetic variability in maize (Zea mays L.) Bangladesh of April.12:217-221. Devadas Ramgopal. 1999. Genetic variability for sugar, protein and yield characteristics in sweetcorn (Zea Mays L.) genotypes M.Sc(Ag), Thesis, ANG Ranga agril.Univ. Hyd-30. Dubios, M., P.A. Rabbens and F.Smith,1956. Calorimetric method for determination of sugars and related substances. Analytical Chemistry, 200:350-356. Hatch Kiss, J.R.P.Revilla and W.F.Tracy.1997. Variation of cold tolerance among open pollinated sweetcorn cultivar. Horti. Sci.32(4): 719-723. Hunsperger, M.H. and D.W. Davis. 1987. Effect of sugary-1 locus on plant and ear traits in corn. Crop Sci. 27: 1173-1176. Johnson, H.W., H.F. Robinson and R.F. Comstock, 1955. Estimates of genetic and environmental variability in soyabean. Agron. 47:314-318. Kempton 1928. Maize and man. J. of Heredity. 17:35. Linderstrom, E. W.1929. Linkage of qualitative and quantitative genes in maize. American nature 63:317-327. Mani, V.P. and G.S. Bist. 1996. Genetic variability in local maize (Zea Mays L.) germplasm of Uttar Pradesh hills. J.of Hill Res. 9:131-134. Reddy, K.H.P and B.D. Agrawal. 1992. Estimation of genetic variation in an improved population in maize (Zea Mays L.). The Madras Agril. J.79(12): 714-719. Satyanarayan, E. and R. Sai Kumar. 1996. Genetic variability of yield and maturity components in maize hybrids. Current Res.25: 10-16. Singh, R and D. Sharma. 1970. Genetic variability in a germplasm complex of maize (Zea Mays L.) and genetic advance through selection of full-sibfamilllies. Indian J.Agril. Sci.40:366-370. Smith. G.M.1955. Sweetcorn: Corn and corn improvement. Academic Press, New York. Vavilov, N.I. 1951. Origin, variation, immunity and breeding of cultivated plants Chronica botanica. An International collection of studies in the method and history of biology and agricultures. Edited by Fransver, Doorn, 13 No.11/6. I want to harvest sweet corn in GAYA Region of BIHAR state. What kind of coperation should i get from your side. I have 2 acres of agricultural land i want to invest in it. My phone number is 9471090773. kindly reply as monsoon is in right the corner. I want to harvest sweet corn in krishna dist Andhra pradesh state. What kind of coperation should i get from your side. I have 2 acres of agricultural land i want to invest in it. My phone number is 9290466245 kindly reply as early as possible. 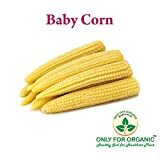 I want to harvest sweet corn in DEOLI, dist tonk Rajasthan state.I want know seed suppliers address and which type of co operation from govt or other concern body I get. my phone no; +91 9414207569, pl reply as early as possible.